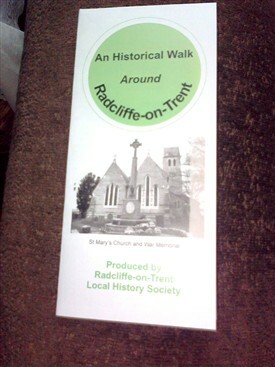 A new publication from Radcliffe-on-Trent Local History Society. Follow the History Trail around the village and learn more about the history of places, buildings and the people who lived here. Look out for the "saddleback tower", a "convalescent home for wounded soldiers in the First World War", the "Royal connection", "Sugar Plum Hall", the home of a "famous wine cellar", a "stone coffin mounted above a porch" and much more. The walk then follows a scenic route out of the village with wonderful views of the River Trent, and finishing back in the centre of the village. Allow about two hours to complete the trail. This page was added by Marion Caunt on 17/05/2012.